I am writing this post simply to publish some photographs which readers interested in T.G. Green and Co. Ltd and the Sherwood Foresters regiment, specifically the 5th Battalion, will enjoy. In September each year, in England, we have Heritage Open Days which were established in 1994 as England’s contribution to the European Heritage Days. One of the key requirements is to offer free access to all properties taking part in the European Heritage Days. This year Sharpes Pottery Museum in Swadlincote, Derbyshire, had organised a talk on the history of the pottery works of T. G. Green & Co Ltd in adjoining Church Gresley, which is now a sad and derelict site, followed by a walk around the perimeter of the site. So along I went. The reason is that I had in my possession a number of ashtrays made by the company in the 1950s and 60s with Sherwood Forester colours and badges. My father Lt. Col Geoffrey S. Aspdin was the last commanding officer of the 5th Battalion. He had taken over command from Lt. Col. Henry W.King in the late 1950s. Col. King was a director of T.G.Green. Col.King obviously had them made for gifts etc. I decided that the time had come to return them to the local pottery museum in Swadlincote, from whence they came, so now I have now done so. 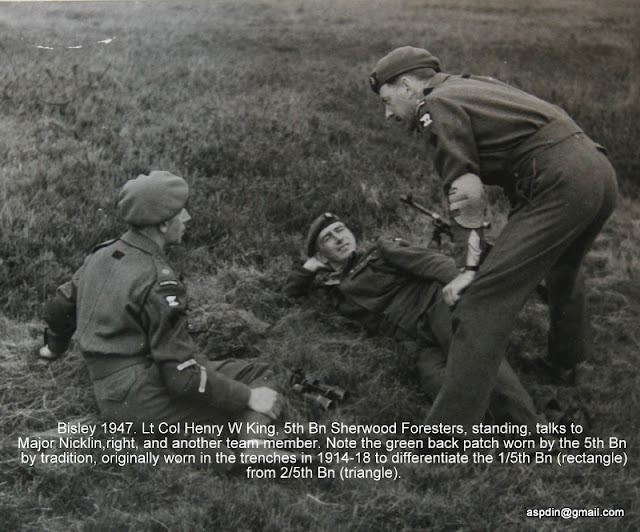 Below I publish some photographs of Col. King when he was commanding the 5th Battalion Sherwood Foresters. To the keen Sherwood Forester reader, note the green rectangular back patch, one on the first ashtray above, irrefutably associating that ashtray as made for the 5th Battalion specifically, and also appearing as worn (by some) as a tradition on the back of their jacket as in the last photo below. Lt Col Henry W King and Lt General Chatteris R.M. Lt Colonel Henry W King, standing third from left. Major Geoffrey S. Aspdin, my father, standing left, Major Nicklin, seated left, Lt Colonel Brian Duncan Shaw, seated right. Col. King was also a personal friend of my father and in the 1960s and early 1970s they used to shoot together at a rough shoot they organised in the land around Staunton Harold Hall on the Derbyshire Leicestershire border near Melbourne. As a child I would invariably be there as a beater. Col. King was a charming man, always interested in what I was up to and full of good advice and encouragement.